Although many articles have been written about international and multilingual SEO I would like to dive deeper in the decision making process and the relevant criteria to select the most suitable structure depending on the site business, geolocalization and language goals, requirements and restrictions. Provides Geolocalization signal with ccTLD. Possibility to have specific local IP for each country. Possibility to geotarget with Google Webmaster Tools. Doesn’t provide Geolocalization signal with subdomains. Possibility to have specific local IP for each. subdomain. Doesn’t provide Geolocalization signal with subdirectories. Cannot have specific local IP for each subdirectory. Adds an additional level of complexity with country subdomains for each version. Adds an additional level of complexity with country directories for each version. Each domain could require specific technical support and hosting costs. Each subdomain could require specific technical support and hosting costs. Only one domain would need technical support and hosting services. Subdomains can be confusing towards users and difficult to market. Subdirectories are not as complex towards users as subdomains but not as friendly as ccTLDs. Authority signals will be specific for each domain and each one should build their own. Authority signals will be specific for each subdomain and each one should be build their own. Authority signals will be consolidated on one domain and inherited by all country versions. The ideal option is to work with ccTLDs –the one that offers more and better geolocalization signals, branding experience and less URL organization complexity-. Nonetheless it’s suitable if you have enough resources to maintain the related costs and build authority signals for each one of the country versions. This is usually the best for already established sites that are looking to expand their business internationally. 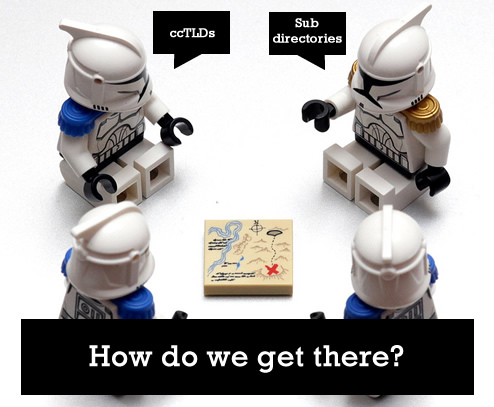 The second best option is to use subdirectories, which don’t provide that many geolocalization signals (localized domain extensions and IP’s) as ccTLDs, nonetheless allow you to hierarchically organize the different versions and consolidate authority signals from all of the localized versions in one domain. This option is the way to go if you don’t have the required resources to maintain many ccTLDs and because of this, usually the most suitable alternative for newer or startup sites. The third, and least recommended option is to use subdomains. On one hand these don’t offer the geolocalization signals of ccTLDs but their maintenance costs and complexity are very similar and on the other, they don’t consolidate the authority signals as subdirectories. In summary, they have the cons of the other two options and almost none of the benefits. You are consistent and stick to only one of them. It’s not recommended to mix the usage of ccTLDs, subdomains or directories since it will be more complex to control and can be also confusing for users. 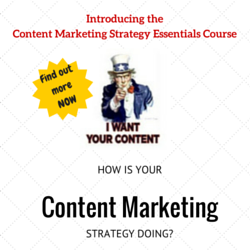 You develop highly relevant, unique, localized, fresh content for each one of the site country versions. If you cannot accomplish these two criteria at the moment, then please take your time and make sure you can before starting a new international version of the site. Your audience is not geographically restricted but speaks many languages. This means that the location of your users is not really relevant to the type of services, products or information you provide, nonetheless, since your users can speak many languages and you want to provide a more personalized experience or specifically relevant content for them you want to enable additional language versions to your site. Since in this case you will likely have a generic top level domain (you don’t need geolocalized ccTLDs) then the best option is to enable subdirectories for each one of the additional languages, for example: www.yourbrand.com/es/ for Spanish www.yourbrand.com/fr/ for French. Your audience that is localized in different international geographic areas speak other languages inherent to their location, so once you have selected an option to internationally geotarget your site (through specific ccTLDs or subdirectories) you will need to decide the language of each localized site version. This can be a straightforward decision if there is only one official language in the country but sometimes can be trickier if there are many that are also largely spoken, as happens in Switzerland for example. If you’re using ccTLDs, your site for Switzerland would be www.yourbrand.ch in German and enable www.yourbrand.ch/fr/ for the French version. If you’re using subdirectories, your site for Switzerland would be www.yourbrand.com/de-ch/ in German and www.yourbrand.com/fr-ch/ for the French version. A common issue in the situation you target different geographic locations with the same language is that your content end-up ranking for the wrong geographic area. For example, Spanish content targeting Mexico located in www.yourbrand.com/es-mx/ can end up ranking in Google.es instead of the www.yourbrand.com/es-es/ content that has been specifically created for the Spaniard market. To avoid this you can use the hreflang attribute along with rel=”alternate” to specify your multilingual content versions and their geographic areas and geolocalize each directory to its relevant country with Google Webmaster Tools. Last but not least, any of the previous international geolocalization and language targeting options will require a certain amount of resources not only to start but also to maintain. 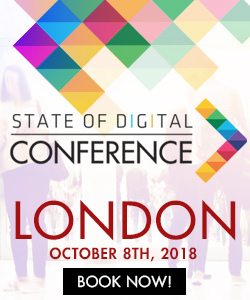 Because of this it’s fundamental that you first validate if the target market and business opportunities are big enough and scalable to compensate the decision of enabling a new international version of the site and all of its related costs –technical support, maintenance, content development, SEO, etc.-, allowing you to achieve a high ROI of the new presence. Superb post Aleyda, solid stuff. A few questions: as I understand it, setting geotargeting in Google Webmaster Tools overrides any geolocation associated with the website’s host IP address. Is that still true? Also, I hear a lot of mixed signals about the use of the hreflang attribute, with some saying it’s pretty messy. You would still recommend implementing it? -Yes, Google Webmaster Tools geolocation should “override” the Website IP address location, the IP address is a “default” signal you provide but the geolocation setting “actively” informs you want to target a specific country. Nonetheless, unfortunately this is still far from being a perfect solution, for example have had situations like a .com.mx ccTLD targeting Mexico also geolocalized to Mexico in GWT but with a Spanish IP, that ended up ranking in Spain in some cases. So at the end of the day if there is the possibility to also have the local IP I would do it to make sure all of the signals are consistently telling search engines the relevant geographic market I want to target. -I also agree with hreflang being a very, very messy “fix”, not a real, scalable solution for big sites. For example, I have seen situations of a site with 27 language versions where they had the 27 link alternate tag with hreflang indicating its other versions… and it surely doesn’t look good. I would say that If it is simple to implement within your system and you can still have a clean HTML head in a situation when these “extra signals” could be more important (same language for different countries) then do it, otherwise it’s far better to concentrate in the other signals (ccTLDs, IP’s and GWT setting). As I commented to Barry before, GWT geolocalization settings should provide the “preferred” signal since is the one you “actively” give, nonetheless unfortunately I have seen situations where it hasn’t had the expected geolocalization effect and that’s why it never hurts if you have the possibility to also have a local IP and ccTLD in order to give all the “consistent” signals you can. I agree with what you are saying, Google’s rel-alternate-hreflang link elements are something small sites can adopt, not without some headaches to implement it in their CMSs but for large sites targeting many languages let’s say more than 5, it is the ultimate nightmare. The effort/benefit ratio makes it a waste of resources. rel-alternate-hreflang annotations in Sitemaps probably an attempt to make the implementation a bit less painful but anyway. The funny thing, Google is quite good recognizing languages and such, why this band-aid now? Hello Ani, thank you very much for your comment! Yes, I totally agree… you can see my comment to Barry before, even with ccTLDs and GWT geolocalization in place you end-up having “missplaced” results. Great post Aleyda. I just wanted to note that, for very specific scenarios, subdomains sometimes are the way to go. For instance, whenever your organic traffic depends on a single keyword or when your targeted keyword patterns include such a keyword. It is true that subdomains don’t inherit the main domain popularity as easily as subdirectories, but keywords in subdomains add a strong on-page relevance factor that in some specific cases could justify it. Hello Fernando, Thank you for your comment! Great post Aleyda. I think sub domains get a bad rep when it comes to international SEO. In my opinion, there is very little difference between sub domain and sub folder. I always find there are far greater business decisions which influence what structure you go with e.g. CMS that allows you to scale across different countries, proper translation work flows, proper SEO work flows e.g how do you work in local keyword mapping etc etc. I hadn’t noticed the update by Google around hreflang, thanks for pointing that out. Also, may of been good to notice that tag in conjunction with the canonical tag where you want to show applicable duplicate content in the correct regional site. I think that’s a real complex area, especially when considering local link building. I guess is about experiences too, but the situations where I have had the necessity to handle geotargeting through subdomains (because of internal restrictions) for not so high authority properties, even with good internal, cross-subdomain linking and good link building, we advanced slower than in other very similar situations with subdirectories… besides the fact that the “not so web savvy” users had problems “getting” the subdomain logic. I agree with you that there are other big challenges in the daily activities inherent to international targeting and additional decisions that also affect (such as a scalable CMS, by the way, I actually developed a checklist to validate its selection: http://www.aleydasolis.com/en/search-engine-optimization/seo-friendly-cms-checklist/) but as I commented at the beginning of the post the “structural” selection that happens at the beginning has a bigger role afterwards that many of the decision makers are aware at the time they choose one and the goal was to give this selection the importance it deserves and provide the criteria to take into consideration for an effective decision making. Really concise article. With regard to the latest developments with alternate lang markup and sitemaps on large sites, where lots of duplicate / similar content is concerned and where dynamic sitemaps have previously proved valuable, I can see potential headaches in implementation. Hello Gavski, Thank you for your comment! Yes, sitemap generation tools will need to start supporting well the new attributes … then, we will need to be careful and set them well to avoid content duplication. Nice article! I specifically like the pros and cons overview. I am curious on your experience with using redirects: if you use a redirect from domain.nl to domain.com/nl/ you have the best of both worlds: the ease of branding/communication with ccTLDs with low complexity subfolders!